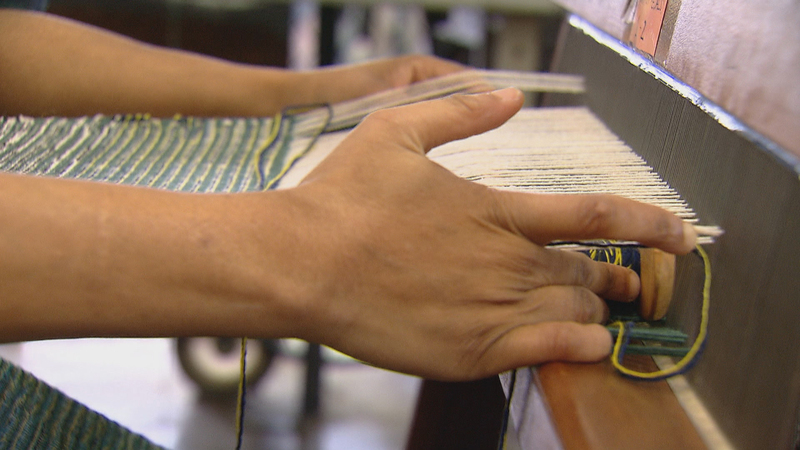 By day, the low-slung brick building home to social service nonprofit Envision Unlimited in the West Town neighborhood is filled with the gentle clicks and clacks of wooden handlooms. But at night, industrial looms chug and clatter, creating wide bolts of vibrant cloth. Both functions make up the fabric of The Weaving Mill, a collaborative studio run by textile artists Matti Sloman and Emily Winter. The Weaving Mill partners with Envision Unlimited to teach adults with intellectual and developmental disabilities the art of handweaving. The program is called WEFT: West Town Education for Textiles. WEFT artists work in groups to create fabric shot through with vivid color that they use to make finished projects like tote bags. Before The Weaving Mill took over the weaving operation, Envision Unlimited program manager Kristen Noonan says participants did the finishing work on tablecloths, placemats and runners, as well as packaging and shipping tasks, for the commercial weaver Chicago Weaving Company. When Envision’s programming is done and their artists have gone home for the day, The Weaving Mill’s industrial dobby looms rumble to life. Sloman and Winter, who met in college, took over an existing small industrial weaving facility to start The Weaving Mill in 2015. Winter was already a teaching artist in the West Town program and alerted Sloman that an opportunity had opened up. “A lot of what we do in our studio practice is look with open eyes at the material is that we have around us, think creatively about how repurpose that and bring it to life, things like saving the short ends of yarns from production jobs and recombining them in ways that’ll be useful for other projects,” Winter said. The Weaving Mill is not a traditional industrial space. For one thing, it’s occupied with Envision’s activities during the day, so production on the industrial looms has to wait until the afternoon. But Sloman and Winter say that the constraints of The Weaving Mill are part of what makes their work unique. “We’ve definitely let go of any idea of reproducibility most of the time, and so most projects are single editions of one-off objects, pushing into that idea of chance and irregularity, introducing elements of chance through the way we run machines or organize materials or decide to finish things,” Winter said. And they say that from the beginning, the WEFT program has brought welcome surprise into their work and the work of resident artists in their Westtown Artist Residency Program, known was WARP. Noonan says that in addition to The Weaving Mill programming, participants have access to a number of different activities that help them develop their social-emotional communication skills and become better integrated into their community. “For instance, there’s a whole recreational biking community we’re starting to learn about and become members of, so we’re amping up for Bike the Drive this May,” she said. “We have a pretty healthy volunteer corps that comes in to assist us with biking endeavors on the 606, and we collaborate with other local shops like West Town Bikes and Working Bikes, so those are really great vehicles for meeting all of those objectives for our folks. Noonan says that while the hope is always some sort of community-based employment for participants, that’s not a realistic goal for everyone. Thus, Envision seeks partnerships with other neighborhood organizations where Envision participants can meaningfully contribute. Jan. 4: Anatomy is at the heart of medical school. To help fellow students remember lessons he struggled with, University of Chicago student Daniel Lam picked up his knitting needles. Oct. 16: A training program and manufacturing plant are not only providing high-demand plastic products, but giving community residents hands-on experience in specialized jobs that are the future of manufacturing.